Our Chairman, David O’Kelly has now completed his annual report for the club. He has provided a succinct and insightful account of the year and is well worth reading. The excert below is food for thought for all our club members. Once again we are indebted to him for his immense contribution to the club. Please do take time to read it by clicking here. We have once again received the kind permission of the Headmistress of Queen Margaret’s School to use the school for our Annual General Meeting and pre-season dinner, so please come along if you can. It is a tremendous boost to the club to have a good turnout at the start of the season. YGCC regrets to announce the death on 13th February of former member Hugh Blenkin. HNL Blenkin, brother of Tim, played mostly in the 1970s, in 72 matches and scored 1856 runs. His wife, Marilla, was also instrumental in breaking down the outdated practice of “no ladies or children in the pavilion until after 6.30 p.m”. A private family funeral has been held. There will however be a Memorial Service in Ashford, Kent on Tuesday 9th April. Further details will follow. Ever fancied playing cricket in a Desert! Nick Gaywood from Desert Springs Cricket has a couple of upcoming cricket events that might appeal to some of our members. He is after players for 2 events at Desert Springs this March/April. In March our younger members may want to visit for some winter sunshine, use the nets, play 2 matches against Spanish oppositions ( both on grass!) and utilise their Championship Golf course! In April Devon Springs have a Wanderers team playing Devon O60’s 24-28th April and need a few more Wanderers! For anyone who might be interested in finding our more. Please visit their website Desert Springs Cricket and / or contact Nick Gaywood via the website. Alternatively send us a message and we can give you his contact details. Is this a picture to add to our archives? We have recently had correspondence from a gentlemen named Jim Clelland, who has been doing some research on the history of Colton village, near Tadcaster. He believes that Edward Maul Lawson-Smith of Colton Lodge was a former Member of Yorkshire Gentlemen's Cricket Club and that matches were played at Colton Lodge. We have given him access to our archives to assist him in his research. He then Kindly forwarded a photo from an elderly resident of the village and posed the question? I’m sure you won’t have any living members who can identify anyone in the photo but are there any clues that might confirm that this is Yorkshire Gentlemen’s Cricket Club ? We may be in the middle of winter but the club is hard at work behind the scenes in preparation for the year ahead. The committee meet in January and will hope to have the 2019 season fixture card published soon. As always we are looking for new, enthusiastic and talented cricketers (of all ages) to come and play for us. If you are interested in finding out more then please contact us here in the first instance and a member of the committee will contact you. Keep coming back to the website for regular updates or join our twitter feed which we hope to make increased use of this season. With the cricket season now well and truly over there is still plenty going on within the club. The committee meet tomorrow. We have our annual dinner to look forward to and of course a report on the season from the Club Chairman. We hope to keep you updated regularly during the closed season and to keep you informed of our preparations for 2019. Wednesday the 25th July saw the Durham Pilgrims annual trip to Escrick Park on another hot sunny day. In a high scoring match the Durham Pilgrims batting first took a liking to the YG's bowling attack and scored at over 8 an over to rack up 346 for 7 declared. An opening stand of 119 by C. Steels and K. Balkwill and a superb 68 ball century by Q Boatswain left us with a tough chase. In reply the YG's scored freely enough but lost regular wickets. Everyone made contributions but no one reached 50 with P Malloch top scoring on 48. At 143 for 7 it looked like a heavy loss on the cards but a good rearguard action by Malloch, Lovatt (21) and last wicket pair Dewi Winkle and Neil Dale saw us reach 235 for 9 at close with the two YG's veterans! surviving 4 overs to draw the match. The long hot summer continues. More good cricket played over the last few weeks of this fantastic summer with some mixed results for the YG's. So far we have only recorded one win this month against The Penguins on the 15th. 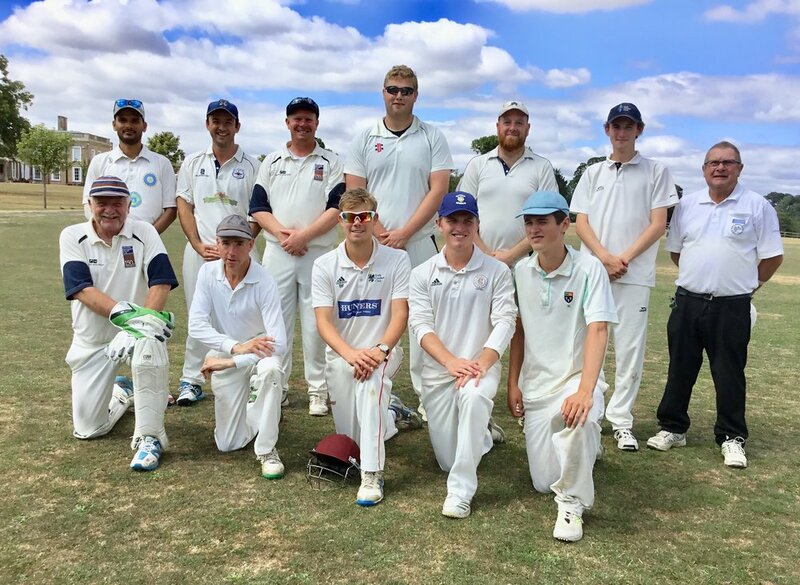 Although not the result we wanted last Sunday proved to be a good game of cricket with The Romany fielding a strong team and batting first. The YG's bowled them out for 176 in fifty overs, with Pankaj Saini the pick of the attack 4-51 off 19 overs. Bevan Fawcett was economical with his 2-23 off 10. In response The YG's got off to a poor start losing, R Exley to the first ball. Harry Adair made a fine 73 and Phil Holland provided support with 25 but no one else got into double figures and we were bowled out for 146 with 12 overs to spare. We look forward to an upturn in our fortunes with three more games this week when we welcome The Durham Pilgrims, Hull Old Grammarians and Leicestershire Gents. Good luck to everyone playing.